Rattlesnake, an American venomous serpent, the type of the family crotalidae, which includes several species, all characterized by a deep pit lined with small plates on each side, beneath and usually a little behind the nostrils. In the genus crotalus (Linn.) 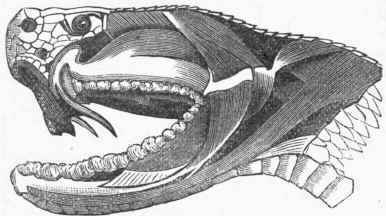 the head is very large, flattened above and triangular, scaly on the crown, with small shields on its sides and the nose; eyes large and brilliant; teeth very small, but the true maxillaries, which are small and attached to the cranium by a small pedicel and by ligamentary union, have a single pair of long curved fangs, laid flat during inaction, but erected when the mouth is opened; these fangs are channelled for the conveyance of the poison secreted by a gland on each side of the head, beneath and behind the eyes; behind the fangs are the rudiments of others, which are developed as occasion requires; there are also two rows of small fixed teeth on the palate; the belly is covered with broad shields; the trunk and tail are scaly above, and nearly all the subcaudal scutes simple. The last three to eight caudal vertebrae coalesce to form a single terminal conical and compressed bone, covered by muscle and a thick spongy skin which secretes the pieces of the rattle, an appendage of loosely articulated horny segments, whose rattling noise has given the popular name to this genus; the rattle may consist of 20 or 30 pieces, the smallest at the end; they are securely strung together, each consisting of three annular portions, the basal ring of one grasping the second of the preceding, and this again enclosing the third of the joint next but one preceding; the first only has a vital connection with, the skin; this apparatus is made to vibrate by the muscles of the tail, with a sound like that of peas in a dry pod. The sound of the rattle closely resembles that made by the 17-year locust (cicada) and grasshoppers. 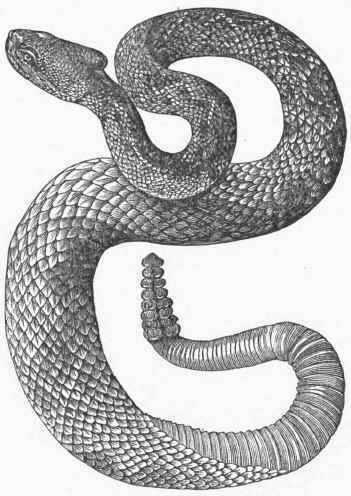 It is popularly but erroneously believed that the age of the snake can be estimated by the number of the rattles; though these may increase with age, their fragility is such that many may be lost from accident; and moreover, more than one may be added annually, according to the vigor, food, state of captivity, etc, of the animal; 20 are not unfre-quently seen in large specimens, but it would be incorrect to conclude from these that the snake was neither more nor less than 20 years old. As the bite of these reptiles is speedily fatal to small animals, it has been generally believed that the use of the rattles is to warn animals and man of its vicinity; but, as other equally and even more dangerous species have no such apparatus, it is more likely that its use is to startle the squirrels, birds, and other creatures upon which it preys from their retreats, or for some other purpose for its own welfare rather than the safety of man. It may serve for its own protection by alarming its enemies and drawing attention to its menacing attitude; yet were this the case we should expect the young to be best provided with this apparatus, whereas it increases in size with age; it has been suggested that it is to call the sexes together. (See vol. vi. of "American Naturalist," 1872.) Rattlesnakes rarely attack man unless provoked, and are sluggish in their movements, unable to spring except from a coil, and are disabled by slight blows. They are ovo-vivip-arous, the eggs being retained until hatched, and the young expelled alive; in winter they retire to holes in the ground, and there remain torpid, several interlaced with each other; they are unable to climb trees, and do not follow a retreating animal which has escaped their spring. They are said to be fond of music, like many other serpents. Some Indians are afraid to kill them, lest the spirit of the slaughtered animal should excite its living relatives to avenge its death. They are capable of attaining to a considerable age, and are tenacious of life under circumstances speedily fatal to most other animals. - The most common is the banded rattlesnake (C. [uropsophus] durissus, Linn. ), 4 to 5 ft. long, ash-colored above with irregular transverse dusky bars, confluent near the tail; vertebral line yellowish, the sides tinged with the same; the body is thick and robust and the tail short and thick; in a specimen about 4 ft. long the head was 2 in., the body 40, the tail 3 1/2, and nine rattles 2 in., the greatest circumference being 6 in. ; there were 177 broad abdominal plates, and 25 under the tail; in the young the tail is black. It is generally distributed throughout the United States, from lat. 45° to the gulf of Mexico, and from the Atlantic to the Mississippi and Red rivers; it preys principally on rabbits, squirrels, rats, and small birds, quietly waiting for them to come within its reach, its bite proving fatal to animals of this size in less than a minute when the snake is in full vigor. It is now rarely met with in the northern states, except in uncultivated and rocky places, remote from dwellings; it is more common in the western states, where its fat is highly prized as an antidote to its bite, and also for rheumatic and neuralgic pains; cattle are often bitten by it, and it is the custom there to cast them and bury the wounded part in the mud, recovery taking place rapidly; this shows the comparatively little danger for a large animal, as there can be nothing curative in the application made. The diamond or water rattlesnake (C. adamanteus, Beauv.) is dark brown or dusky above, with a series of large rhomboidal spots continuous from head to tail; abdomen dirty yellowish white; the mouth is large, the neck small and contracted, and the body long and thick; it is the largest of the genus, and may attain a length of 8 ft.; in one about 6 ft. long the head was 2 3/4 in., the body 60, the tail 2 1/2, and the rattles 3 in. ; abdominal plates 172, and 25 subcaudal. It frequents damp and dark places, always near water, though not living in it; it is one of the most hideous and sullenly ferocious serpents of the family; its range is very limited, from North Carolina to East Florida, on the seacoast. The C. horridus (Linn.) is a native of the warm parts of South America; it attains a length of 5 or 6 ft. and the thickness of a man's wrist; the color is yellowish brown varied with darker, on the lower parts lighter; there are wide lozenge-shaped spots along the back edged with white, with light stripes and other smaller and less distinct spots on the sides; brownish black bands between the eyes, and from the top of the head along the neck. It is found only in dry, rocky, elevated regions, covered with thorns and bushes; the negroes esteem its flesh a delicacy; it often bites and destroys cattle coming near its retreat, the poison being more virulent in tropical climates. - The genus crotalophorus (Gray) seems to connect crotalus with trigonocephalus (copperhead), having the rattles of the former and the plates on the head of the latter. The small or ground rattlesnake (G. miliarius, Gray) is dark gray above, with a brownish red vertebral line interrupted by a row of subquadrate black spots margined with yellow; a double series of black spots on each side, the upper larger but less distinct, and a white streak backward from the eyes. It is generally from 16 to 18 in. long, and is common in the United States as far N. as lat. 35°, in dry places among leaves, preying on field mice and small birds; its bite is fatal to small animals, but not to man. The prairie rattlesnake (G. tergeminus, Say) is a little over 2 ft. long; it is cinereous above, with a triple series of dark brown spots, and a double series of dusky spots below; it is fond of hiding in the holes of the prairie dog (cyno-mys), on the young of which it chiefly feeds; it occurs in the country near the Rocky mountains and the sources of the Missouri. Other species are described by Dr. Holbrook, and by Baird and Girard. - The poison gland is compressed by the temporal muscle during the act of striking; there is a very extensive communication of the glandular tissue with the vascular system, the blood vessels surrounding the secreting tubes in a capsular manner. Microscopically the poison appears as a limpid hyaline serum, with crystals of ammonio-magnesian phosphate, according to Dr. W. I. Burnett. According to Dr. Mitchell it is yellow, acid, glutinous, of a specific gravity of 1.04; devoid of taste, smell, and acridity; beginning to coagulate at 140° F., and soluble in water. It consists: 1, of an albuminoid substance, coagu-lable by pure alcohol but not by a heat of 212° F., called by him crotaline, the poisonous element; 2, of a non-poisonous albuminoid compound, coagulable both by heat and alcohol; 3, of a yellow coloring matter and an undetermined substance, both soluble in alcohol, traces of fatty matter and free acid-saline bodies, chlorine, and phosphates. No temperature from zero to 212°, nor acids and alkalies at moderate temperatures, nor alcohol, chlorine, nor iodine, destroy the poisonous property of the venom. This fluid is fatal even to the bitten snake; it destroys the vitality of the blood and its power of coagulation, as by a lightning stroke; it probably acts as a powerful sedative through the blood on the nervous centres; hence the best antidotes are active stimulants, especially alcohol in some form; and, vice versa, intoxication may be neutralized by taking this poison into the stomach in the form of pills. The poison varies in intensity according to season, climate, and vigor of the animal, being most active in tropical regions and in warm weather, when it has been long retained or the animal is greatly irritated; cold-blooded animals generally suffer little from its bite, and pigs kill and devour it with impunity and avidity, their covering of fat preventing the introduction of the poison into the circulation; its virulence is soon exhausted by rapidly succeeding bites, as has been proved by experiments on chickens and rats; as its secretion goes on for some time after death, experimenters should be careful in their manipulations about the fangs and poison apparatus. Many plants and other substances are reputed to be efficacious against the bite of the rattlesnake; but none have been proved to be so when the poison fangs have actually entered the tissues. - For details on the habits of these serpents, on the anatomy of the parts concerned in the secretion and expulsion of the poison, and in the infliction of the wound, and for a full enumeration of genera and species, with illustrations and copious bibliography, see a memoir in vol. xii. of the "Smithsonian Contributions to Knowledge" (1860), by S. Weir Mitchell, M. D., and an abstract of the same in the secretary's report for 1860 (8vo, Washington, 1861). Head of Rattlesnake, showing Poison Fangs. Rattle and Section of Rattle.